Previously, trading packs would be the best way of farming coins in ArcheAge. Unfortunately, the Gold Trader is no more in the game. However, there are still other effective ways of earning gold in ArcheAge. Now, we Joymmo.com would share the 6 main ways are popular to make money, to help you along your way. Indeed, monetary rewards for individual quests aren't very large, yet they can still be a decent source of income, particularly early in the game when launching other ventures needs capital. Besides, when killing monsters to complete quests, they might drop a Coin purse, which contains silvers and in some cases some valuable crafting materials that can be sold on the auction hall. Stone is easy to locate and always in demand, so mining it in excess can mean a large amount of ArcheAge gold in your pocket. This staple item is currently in demand across countless servers, and a stack or two of stone bricks can even earn you a highly valuable APEX, which can lead to even more ArcheAge gold. Keep an eye on your labor points, though, as they will deplete over time as you mine. Players never would lke to vendor any gear that is level 20 and above. Instead players will like to use evenstones to break it down. That will provider players wither sunlight, moonlight or starlight Archeum, which is a valuable resource as it's used to craft all sorts of gear. Additionally, evenstones can be purchased at any general vendor for 5 silvers and players will be able to sell the Archeum ar dust level and above for much more. Farming is a basic way to make money in ArcheAge. To unlock farming ability in the game, players need to level his character up to around 20-25 and complete Blue Salt Brotherhood quests. These quests can give you a small scarecrow farm, large scarecrow farm, and a donkey for transporting trade packs. Once you complete the quest for the small design, you can deploy it in a housing zone and start farming. What to plant entirely depends on what is selling for a good price. You will learn what is a good price and what items sell the best on your server. Another easy way to get some money is fishing. You just need to get some earthworms, which you can gather when planting crops, and go to the sea to fish. If you became a fishing fan, you can also build a boat, although that might be pricey, and exposes you to pirates and thieves. Why work to earn ArcheAge gold when you can just buy it directly? Joymmo.com is a secure and reputable online marketplace for buyers alike. Just about every major item or currency for the most popular games on the market, including ArcheAge Online, is available, and accounts are completely free. 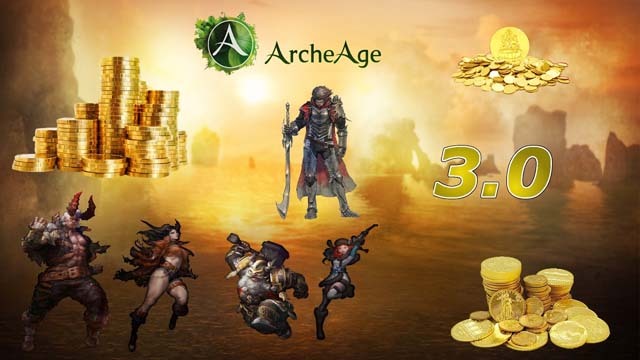 Herein you can find different package of Cheap ArcheAge Gold for your option. In addition, compared to other online sellers, our price is competitive and our delivery is faster. So, why not have a try?